Villa Flora is in fact the name of the house where Arthur and Hedy Hahnloser used to live in Winterthur, Switzerland, from 1898. He was an ophthalmologist; she designed fabrics and toys; and both loved art. Between 1905 and 1936 they bought a lot of paintings, all exhibited in their house. They also met many artists as they loved being directly in touch with them and welcoming them in the Villa Flora: Pierre Bonnard, Felix Vallotton, Henri Manguin,… and many others have become friends of the couple Hahnloser! Since 1995 the descendants of Arthur and Hedy Hahnloser have opened to the public the Villa Flora, where one can admire not only the paintings exhibited in Paris but also the environment and atmosphere of the house, including beautiful pieces of furniture and an elegant garden. Thanks to the temporary closure of the Villa the paintings have been authorized to move and are currently exhibited in the Musée Marmottan: A great opportunity to admire them without travelling to Winterthur! The exhibition shows the works chronologically and artist by artist, with very interesting comments (both in French and English) about the relationship Arthur and Hedy Hahnloser had built with each painter. The first two, Giovanni Giacometti and Ferdinand Hadler, both Swiss, have been a true discovery for me. I loved the colourful paintings by Giacometti and did not know before visiting this exhibition that the father of the famous Alberto Giacometti was a talented painter himself. I also loved the mountains’ landscapes painted by Ferdinand Hadler, in particular ‘le massif de la Jungfrau vu depuis Mürren’. 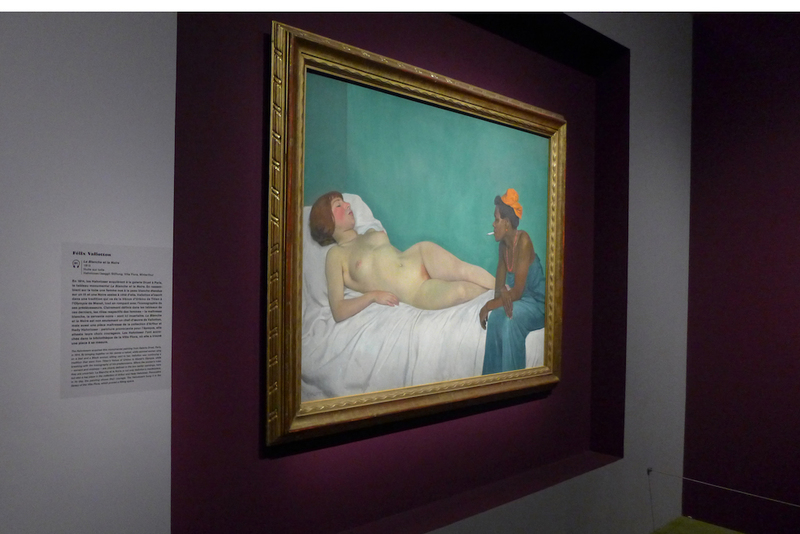 Felix Vallotton and Pierre Bonnard are the two painters the most present in the collection of Arthur and Hedy Hahnloser. Both had been invited at the Villa Flora on several occasions and became friends of the couple. 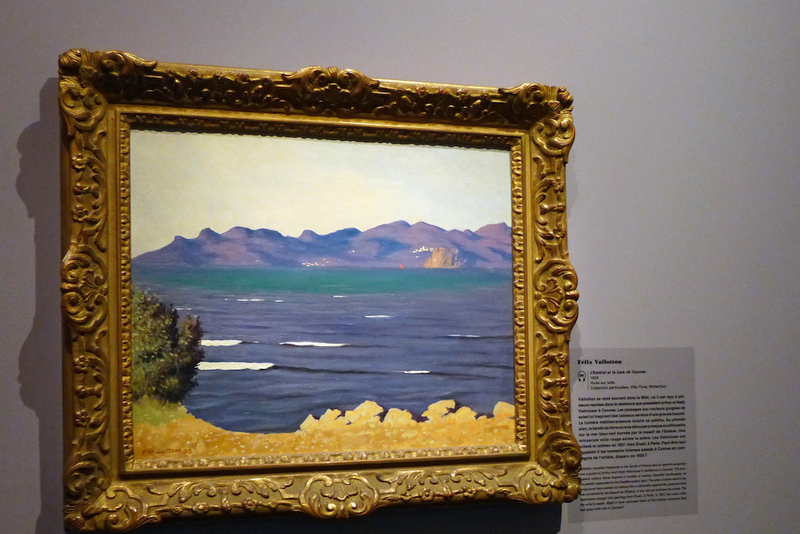 I have been very impressed by the beauty of the paintings by both artists that I saw at the exhibition and have spent a lot of time admiring ‘l’Esterel et la baie de Cannes’ and ‘La blanche et la noire’, by Felix Vallotton and also ‘Le débarcadère de Cannes’, by Pierre Bonnard. 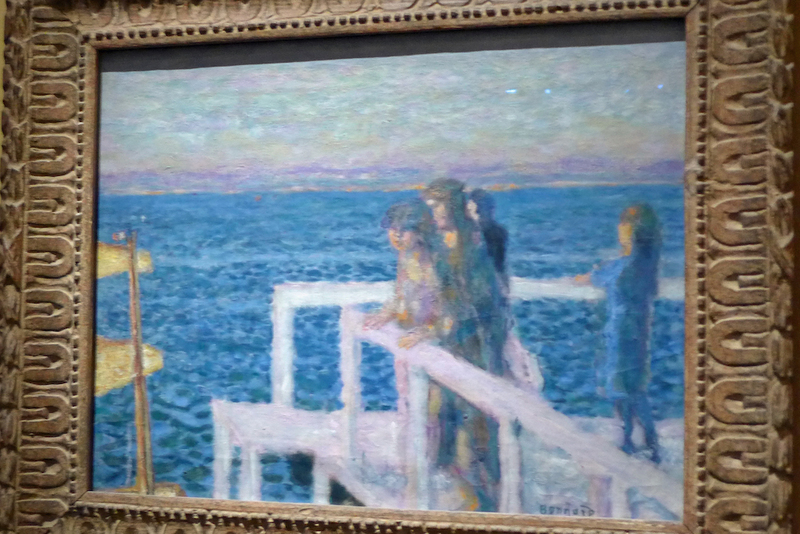 The light and the colours of those three masterpieces are really amazing!… And I could escape detection and take some forbidden pictures; I apologize for the framing which is not always the best due to the watchfulness of the museum attendants! All the paintings are highlighted by the colourful walls on which they are exhibited whether golden yellow, mauve or plum-coloured. 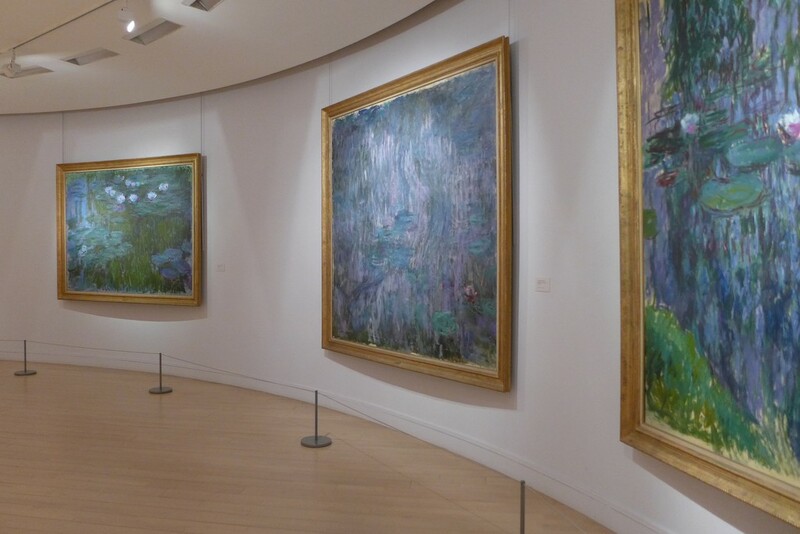 Most of them were made by contemporary artists of the Hahnloser: Edouard Vuillard and Odilon Redon, and the ‘Fauves’ Henri Matisse, Albert Marquet and Henri Manguin. And almost all are true masterpieces. Among them my two favourite are: ‘Les anémones’ by Redon and ‘La partie de dames à Amfréville’ by Vuillard. One can also admire a few works painted by famous artists of the previous century (Cézanne, Van Gogh, Manet, Renoir) that Arthur and Hedy Hahnloser bought in auction sales, following the advice of their friends painters. Among those my favourite is ‘Le Semeur’, by Van Gogh, which was bought in auction by Hans, Hedy and Arthur’s son, as he was only nineteen: what a sense of art and beauty! The entrance ticket includes not only the temporary exhibition Villa Flora but also the permanent collections of the museum. And the Musée Marmottan is a true gem, a bit away from usual tourist routes due to its outlying location in the 16th arrondissement near the Bois de Boulogne. However the 10 minute-walk to reach the museum from the closest metro station (La Muette on metro line 9) through the Jardins du Ranelagh is really pleasant. So take advantage of your visit to the exhibition to see the permanent collections of the museum. The paintings by Claude Monet are shown on the basement in beautiful renovated rooms with a light oak wooden floor and an excellent lighting and it is a real pleasure to admire the majestic Nympheas, the famous ‘Impression, soleil levant’, the beautiful ‘Paysages de Norvège’ with either blue or red houses, and many others. One can also admire in the Musée Marmottan the biggest collection in the world for Berthe Morisot’s masterpieces and many other famous impressionnist paintings displayed in the various rooms of this beautiful mansion from the 19th century. 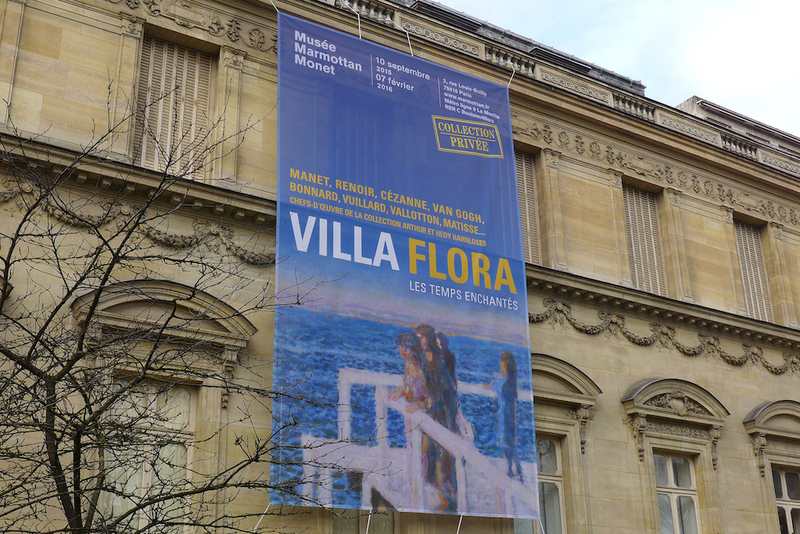 One can expect a 2-hour visit for both the Villa Flora exhibition and the permanent collections of the museum; and believe me, you will lose track of time!